What is a Flour-Drum Stove? Who needs a Flour-Drum Stove? Why do we need Flour-Drum Stoves? How do you make a Flour-Drum Stove? Click to see the Flour-Drum Stove in action out bush! A Flour-Drum Stove is an innovative cooking device for healthy outdoor meal preparation. Take one empty Flour-Drum, cut a rectangular door in the side for adding fuel, cut some horizontal slits around the top of the drum and more about 20cm from the bottom of the drum. Then, open up the slits by pushing in one side of the slit in with your thumb. Your stove is now complete and ready for use (download the instruction manual for making a stove). If you don't have access to a flour-drum, then find another drum to make your stove. For example 20 litre paint drums (visit you local painter or paint supplier), cooking oil drums (visit your local takeaway or restaurant). Other drums may require that you cut the top off, but an angle grinder will make short work of this. When your stove is ready, place some dry leaves and sticks inside the stove and ignite. As the fire gets going, add more sticks and allow the fire to create some coals. Then, place your preferred cooking instrument on the top of the stove. Suitable cooking instruments include a wok, a frypan, a broiler, a hotplate, or a saucepan. A wok is a very versatile cooking instrument, fits perfectly on and works well in combination with the stove, and is highly recommended. The slits around the bottom of the stove allow air to enter to provide oxygen for combustion, and the slits at the top allow smoke and heat to escape and allow draft to occur. You will need to keep on adding sticks through the rectangular fuel door from time to time. 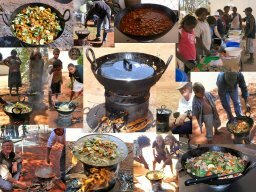 A flour-drum stove can be used for cooking healthy family meals when camping, or when there is no stove or electricity. This book explains how to make a flour-drum stove and how to use it. The book includes recipes which are suitable for families in remote areas far from big supermarkets and specialty food shops.